Indian Bank Balance Check Number: Are you searching for bank balance enquiry number? Here I am going to list all missed call balance inquiry number by which you can check account balance details. Only you have to call(miss call) on these number and you will get bank balance through SMS on your registered Mobile number. Bank balance checking numbers are toll-free. Indian Bank user can call on 09289592895 for bank balance inquiry. ( We highly advise you should register your mobile number in your bank for getting balance inquiry on your mobile. ) . 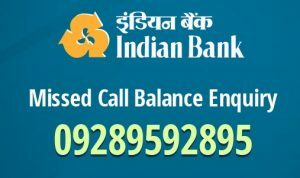 These are Indian bank balance enquiry number to check all bank balance details right in your mobile through call or SMS. I hope this number works for you. If you found any missed call number was not working or you didn’t found your bank missed call number then let us know in the comment section. And also share this balance checking number list with your friends.